Filmed live at Obras Stadium, Buenos Aires, Argentina, on October 9, 2005. Megadeth is one of the most commercially successful heavy metal bands, selling more than 20 million albums worldwide, including the Grammy nominated multi-platinum Countdown to Extinction. In the U.S. alone, Megadeth have received four platinum records, six gold records, and seven Grammy nominations for Best Metal Performance. Songs: Blackmail the Universe, Set the World Afire, Wake Up Dead, In My Darkest Hour, She Wolf, Reckoning Day, A Tout Le Monde, Hangar 18, I'll Be There, Tornado of Souls, Trust, Something That I'm Not, Kick the Chair, Coming Home, Symphony of Destruction, and Peace Sells. Filmed in October of 2005 in a packed stadium in Buenos Aires, Argentina, 'Megadeth: That One Night - Live in Buenos Aires,' is a fast paced, energetic concert film, that sees the heavy metal band go through seventeen of their hits. Well, at least I think they're hits. To be honest, I'm not really sure. You see, I'm not actually much of a heavy metal fan, and before watching this disc I don't think I could even name a single Megadeth song. With that said, despite my own lack of affinity toward the music, fans of the group should definitely be pleased with the show itself. The program starts off with some brief interviews and documentary style footage of the band on the road preparing for the concert. We also get a look at the excited fans waiting for the show, and even see some of the band members sit down for an acoustic jam out on the grass with their admirers. These very brief distractions immediately segue into the actual concert, which then plays on pretty much uninterrupted for the remainder of the ninety minute running time. Band members Dave Mustaine, Glen Drover, James MacDonough, and Shawn Drover take to the stage and go through guitar shredding, drum thumping, track after track, including "A Tout Le Monde," "Wake Up Dead," and "Symphony of Destruction." The music itself is lively and fun, though tracks tend to sound very similar and a bit too generic for my own tastes (many fans will surely disagree) and the lyrics themselves are often hard to make out. Lead vocalist and guitarist, Dave Mustaine, has decent stage presence and gradually increases his hold over the crowd as the show goes on. While he starts off pretty stationary and purely focused on his actual playing, he eventually begins to work the audience with classic rock star bravado, getting the sea of spectators to chant, sing along, and of course, head bang to the powerful riffs and rhythms. The filmmakers have covered the event from a variety of angles and setups, creating an often dizzying, exciting montage of performance images. Standard shots of the band and crowd are lent some added gusto, with camera pans, zooms, split screen, and lots of cool, swooping crane movements across the stage and jumping mass of devoted fans. This all gives the proceedings a more epic flair. The cutting is often quick and relentless, moving with the powerful rhythms of the music. This makes for a fun visual experience, but can be a little disorienting at times. Some very brief cut backs to documentary footage of the band are also thrown in between some tracks, but they seem rather out of place and unnecessary. The outdoor venue itself, Obras Sanitarias stadium, provides a cool backdrop for the event, and massive screens behind the stage project the band's performance out over the crowd. Vibrant, neon colors set the stage ablaze with energy, strobe lights provide some extra excitement, and artificial smoke intensifies the mood, all working well with the style of music and personality of the group. While I barely knew who Megadeth was before watching this disc, and still can't profess to being much of a fan, those that are already admirers of the band should find a lot to like in this performance. The group seems to be firing on all cylinders and the visual choices add some palpable, but occasionally excessive stylistic flourishes to the presentation. The uninitiated need not apply, but the Megadeth faithful should be in for a head banging good time. Image brings 'Megadeth: That One Night - Live in Buenos Aires' to Blu-ray on a single BD-25 disc that comes packaged in a standard case. After some logos and warnings, the disc transitions to a basic menu. The packaging indicates that the concert is region A, B, and C compatible. 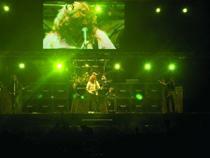 The concert is presented in a 1080i/AVC MPEG-4 transfer in the 1.78:1 aspect ratio. Though I can't say for certain, the show appears to have been shot on standard definition digital video, and the image looks like a basic upconvert job, which should disappoint many fans. Numerous video artifacts are visible throughout, including edge enhancement, aliasing, and noise. Detail is of course subpar, as this doesn't appear to be an actual high definition image. There is rarely any sense of depth and the picture has a flat look. Colors are actually pretty nice, with the concert's vibrant lighting design coming through well. Black levels tend to be elevated, though whites bring a decent sense of contrast. The video doesn't look terrible, but the fact that this is probably just a standard definition image upconverted, greatly limits the appeal, value, and potential score of the transfer. Essentially, this looks like DVD quality material, and that just doesn't cut it on a Blu-ray disc. The show is provided with a DTS-HD Master Audio 5.1 track and an uncompressed PCM 2.0 track. Both sound mixes are strong, and the band's energetic, powerful tracks come through with some nice kick. Vocals are technically clean, but it can be difficult to actually make out what Mustaine is singing. There is some good separation across the soundstage, with the individual instruments coming through with nice distinction. Surround activity is also good, with lots of lively crowd reactions booming from the rears, giving the listener an authentic concert experience. Dynamic range is solid, and bass has some occasionally rocking punch. Balance between the musical elements is good, but the instruments can swallow up the vocals every now and then. 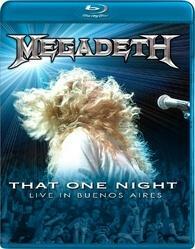 'Megadeth: That One Night - Live in Buenos Aires' gets a strong audio presentation. The music itself doesn't exactly demonstrate the most range, but the mix is loud and aggressive, just as it should be. Bonus Track - Symphony of Destruction (SD, 4 min) - Presented in standard definition with DTS-HD Master Audio 5.1 and LPCM 2.0 sound, this is an alternate mix of the band's performance of "Symphony of Destruction." 'Megadeth: That One Night - Live in Buenos Aires' is an energetic concert from the band, but the actual value here will truly depend on whether or not you're already a fan of the group. The audio mix is loud and aggressive, but the video is basically DVD quality. Supplements are sparse and rather useless, but the concert itself has a healthy running time. Though the video transfer is sure to disappoint, fans should still be pleased by the show.